The Teen Economists: Why is Venezuela Running Out of Toilet Paper? Why is Venezuela Running Out of Toilet Paper? My friend and I used to play an “impromptu-speaking” game where we would switch turns throwing out a word and having the other person speak for a minute on that topic. One night when I was having a sleep-over at my friend’s house, we decided to play this game. It was about 12 am at night so we were both in that goofy, sleep-deprived, second-wind stage. My friend decided to give me the word – toilet-paper. Really? I have to speak for one entire minute on toilet-paper?!! My response went something like: “Well, toilet-paper is thin white bathroom tissue, sometimes with little designs on it, used by individuals in bathrooms to…um…wipe…It is a very good thing to have!! If you didn’t have toilet-paper, you would have to… *ahem, let’s skip that part*…Anyways, it is useful and found in sanitary countries…hopefully…” I then proceeded to ramble on for about 40 more seconds about things only vaguely reminiscent of toilet-paper. The one description of this product that did not enter my speech was the fact that some wealthy countries don’t have enough toilet-paper. Like Venezuela. It was something I never even thought possible. Until now. Venezuela’s government bases its economics on the principles of socialism and big government. Essentially, the former dictator, Hugo Chavez, held to the idea that the government should manage all areas of the economy. Starting in the early 2000s, when the poor complained about prices for goods being too high, Chavez instituted artificial price ceilings, or price caps. These price ceilings have resulted in a decrease of supply for basic necessities, like toilet-paper. In early 2012, the Venezuelan government ordered major suppliers of personal care products to “lower the price of shampoo by 25 percent…the price of medium-size diapers…by 23 percent…[and] toilet paper …by 11 percent” (Devereux). As the government continues to institute these artificial price ceilings, the producers can no longer make a profit from selling their goods. As a result, they cut back on the production of those goods. Less production means less supply. Less supply means a shortage of goods. The current shortage of toilet-paper in Venezuela comes as a direct result of the government management of economic policy that is currently in place. The consequence of these price ceilings has been that the government has now had to institute a ration on how many rolls of toilet paper each individual can use, and the people must stand in long lines in order to receive those rolls. Venezuela is importing 50 million rolls of toilet paper to try and offset that shortage. In an attempt to encourage companies to produce more products – without taking away the artificial caps – the government must either nationalize the companies and run the factories themselves or offer subsidies to the producers to make up for the high costs of production and low selling prices. How simple would the solution be if the government would simply remove the price cap? Equilibrium price and quantity would be restored, producers would have motivation to produce more toilet-paper in order to make a profit, and the consumers would be able to buy what they need when they need it. This situation with Venezuela illustrates artificial price controls in real life. While price floors create surpluses since more producers want to sell at the higher prices and fewer people want to buy at those prices, price ceilings creates shortages since the producers choose not produce as much at the lower prices but consumers want to buy more. If these controls were taken away, the market would return to its equilibrium level, eliminating the problem of an excess or lack of goods. Or in the case of Venezuela, people would finally have enough toilet-paper to take care of their business. What a relief! 1. Devereux, Charlie. "Venezuela Sets Price Caps on 19 Personal Care Products." BusinessWeek. Bloomberg L.P., 2013. Web. 4 Oct. 2013. http://www.businessweek.com/news/2012-02-27/venezuela-sets-price-caps-on-19-personal-care-products. 2. Gallegos, Raul. "Venezuela Is Running Out of Toilet Paper." Bloomberg. Bloomberg L.P., 2013. Web. 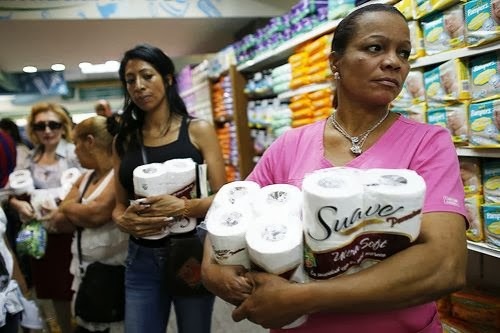 4 Oct. 2013. http://www.bloomberg.com/news/2013-09-27/venezuela-is-running-out-of-toilet-paper-.html.